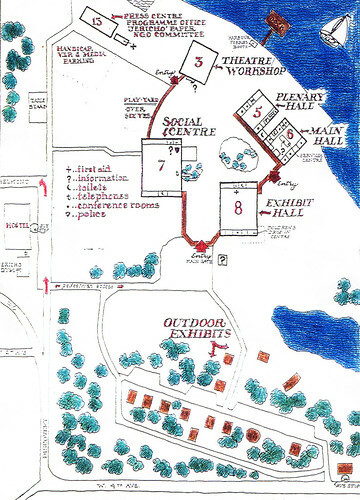 On this hand-drawn site plan from the original Habitat Forum site brochure, do you see the building at upper left marked #15 – Press Centre? Today that building is the Jericho Sailing Club, and it is all that remains of this site (with the exception of the driftwood sculpture on the homepage and the wharf railings). All of the other buildings on this plan were demolished circa 1980, despite public outcry. “Dar Al-Imara ” Baghdad – Iraq. The morning updating sessions were excellent although it was freezing cold at the Plenary Hall. The construction of this hall was not completed yet. Blankets were distributed. Canada’s PM was there when the Red Indian rights were discussed. He was in a sport suit carrying his son on his shoulders. The Buckminster Fuller lecture was on the open ground with engineers, scientists, women and children all around. That was a great conference to establish the UN HABITAT.